Flora Danica duvets and pillows. Traditional handcraft - Made in Denmark. Flora Danica was originally the name of Simon Pauli’s herbal book from 1648. This beautiful work contains many hundreds of original drawings of medicinal herbs from the Danish flora. Flora Danica is also the name of the handdecorated dinner service from Royal Copenhagen. The Flora Danica duvet concept is built on traditional Danish craftsmanship and design. 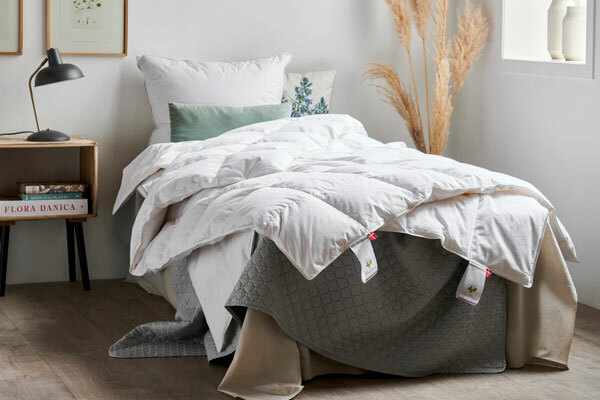 These exclusive duvets and pillows are exclusively composed solely of the nature’s own raw materials. The Flora Danica duvets are extremely comfortable and luxurious. The pillows give your head the best possible support.